Adventure Time has evolved a lot in four years. But the core of this whimsical post-apocalyptic fantasy cartoon has remained the same. Jake the dog has kids, but they don't change his life much. Princess Bubblegum gets young, then she's old again. But producer Adam Muto tells us the show is finally ready to make serious changes. Spoilers ahead, for those who haven't been caught up on the show. At the end of season five, Finn found out that his human father is still alive — setting up a quest to find his dad at the start of season six. And Muto tells us that unlike with the "Jake's pups" and "Princess Bubblegum" situations, the fallout from this big revelation will not be rolled back or dealt with quickly. The first eight episodes of season six deal with Finn and his dad, and play out the new status quo of Finn having a father figure in his life again. In fact, those first eight episodes are some of the most cohesive storytelling they've ever done. There will be some pretty major changes, which will actually stick, and the show will explore those changes over the course of eight episodes. Muto says the show's creators are excited, because this is some of the most insane storytelling they've ever featured. But they know at the same time that some people are going to hate it, Muto says with a laugh. How does it change things for Finn, personally, having a dad at last? "He's had a dad," Muto says. "He thinks of Joshua [Jake's father] as a dad." The big deal for Finn is that he finally has another human around — "so he has more curiosity than a strong familial bond." The writers are trying to approach this situation realistically — like, if you had a long lost relative, you wouldn't know how to feel about this. "We'll see them processing that in the first episode," says Muto. In general, we've seen a pretty gradual arc for Finn away from his original simplistic worldview — in the beginning, says Muto, Finn saw things in pretty black-and-white terms. There were good guys and bad guys, and he was going to beat up the bad guys. The show has always maintained a certain amount of distance, especially for adult viewers, between the simple way Finn sees things and the reality of what's going on. But slowly, Finn is starting to see the world as more complicated. Along with Finn growing up, we're starting to see a darker picture of Princess Bubblegum. Originally, she was just sort of Finn's love interest, says Muto, and then the idea that she was a science genius was played up a lot. Over time, she's gotten more complicated, and we've started to see a lot of signs that's she's sort of evil. How dark can this storyline get? "It's gotten pretty dark already," says Muto. They've already pushed the notion of Princess Bubblegum being evil pretty far, without actually crossing that line, and he's not sure how much further they'll go. The thing is, Princess Bubblegum is a ruler — she's an autocratic monarch of a kingdom, who makes decisions for everybody. And meanwhile, the show has been slowly playing up her "mad scientist" side, says Muto — all of her subjects are also her experiments. Muto says it doesn't weird out the show's creative team that adults are so obsessed with Adventure Time and create so many theories and artworks about it — because the creators are all obsessed with it too. They're grown-ups who spend all their time getting sucked into debating the show's mythos, so they totally identify with the show's adult fans. In fact, early on when the show started, the only way to get feedback on it was to look at the internet and see what people were picking up on. Muto says the creators would find themselves noticing which lines and scenes really excited people or inspired them to make art. Now, of course, there's way more feedback, but some of the people who work on the show still spend a lot of time on the internet. The only downside of that is, you run into the haters as well — but Muto says you can't cherry-pick. You have to take the praise along with the hate. They were really proud of the episode "The Red Throne," in which Flame Princess almost loses her throne to her father, and Finn has one of his harshest lessons yet, getting shown up by Cinnamon Bun. But Muto says they were kind of shocked by how much a lot of the internet seemed to hate that episode. Fans do seem to clamor for certain storylines to move forward more quickly than they actually do — chief among them, the slow exploration of the Ice King's past and future. We asked Muto how soon we'd see some more development of the Ice King's storyline, in which his old girlfriend Betty has come forward in time to save him, and Muto says it may not move that much until the middle of the season. The Ice King's storyline is something that the show has built up really, really slowly, since the beginning. And the creative team doesn't believe in paying things off too quickly, especially with some of the side characters. There are certain things that are "final season" developments, for characters like Simon/Ice King, that can't arrive too soon or the show will run out of steam. Are Finn and Jake drifting apart? One thing we'd noticed recently is that a lot more episodes seem to be showing either Finn or Jake alone, rather than the two of them together. Are they starting to drift apart? So if there's a story about Jake's pups, for example, Finn will be pushed into the background. And when Finn's dad shows up, the stories will naturally focus on Finn, with Jake in the background. They're both such strong characters, it's easy to send them on adventures separately, says Muto. Adds Muto: "It's easy to follow Jake for an episode, without Finn to check his weirder instincts. And you treat it differently with Finn on his own than with Jake — we can go deeper than we would with Jake in the mix." As the world grows more and more complex, too, it makes more sense to send Finn and Jake off separately, so they can explore different corners of it, adds Muto. Speaking of that complexity, are Finn and Jake becoming less central as other characters, like Simon or Bubblegum, take up more space? "That's something I'm worried about sometimes," admits Muto, "Whether we're moving away from [Finn and Jake] as the center. But it's more exciting to use the side characters sometimes." For example, the recent storyline about Lemonhope, the savior of Lemongrab's realm, couldn't have worked with Finn as the main character — because Finn wouldn't hesitate to step up and be a hero. 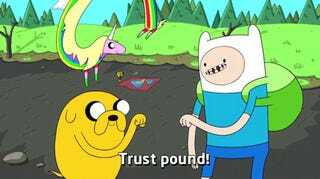 Sometimes, the writing staff worries about repeating the same stories about Finn and Jake over and over, and focusing on other characters is one way to avoid that. Adventure Time season six premieres on Monday with a special half-hour episode. Thanks to Michelle and Ed for helping us recover some of the audio of our interview!